I have not walked on the moon but I know the lightness of escaping gravity - it comes when I unbuckle my backpack and drop it to the ground on the summit of Mt Feathertop. The pack is loaded with my share of our 5 days of food, plus three litres of water, half a tent, clothes. It hits the ground with a thud and my first few steps on the summit of Mt Feathertop are just that - I am a feather on top of the world. Without weight, I walk in light bouncy steps. My muscles feel stronger now they only have to lift bone and flesh. Just off the summit, someone has carved out a small sleeping pad and so we quickly set up camp and peg the tent down with extra attention. Things are exposed up here. The mountain drops away on either side with a steepness that gives this place its famed alpine profile. 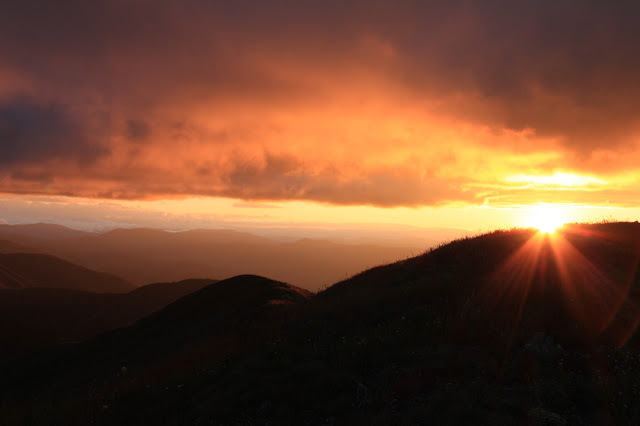 Mt Feathertop is a mountain that drags bushwalkers in, like it does the weather. Just put Mt Feathertop through your search engine and the results are outstanding. Flick back through every adventure or bushwalking magazine and there it is, again and again, raising its wonderful, sharp profile every few years - awildland is joining a long line of bloggers writing about this mountain. 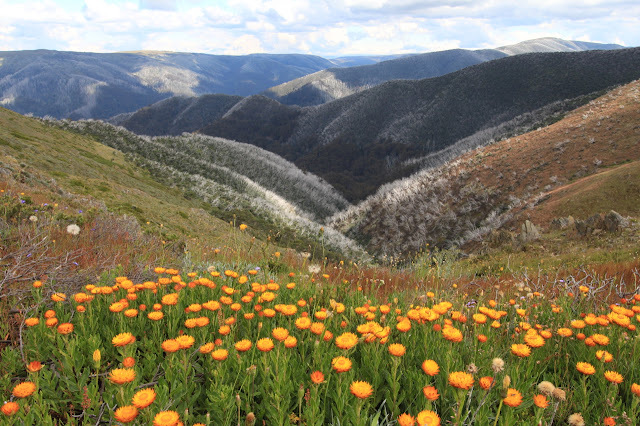 Caz thinks its appeal is its uniquely alpine look - we don't have any other mountain in Australia quite like Feathertop - steep-sided, cornices in winter, sheer gullies and its razorback ridge approach. The superlatives are certainly there - iconic, charismatic, classic, gorgeous, challenging, and the second highest peak in Victoria at 1,922m. For some online feasting of Feathertop visit Andrew at Trails and Tracks having an epic adventure in the snow. More snow and a mighty cornice shot can be found in a spring ski session from MountainWatch. Memorable for the Melbourne Bushwalkers on mighty Mount Feathertop. And, most recently, Mt Feathertop featured in the Sydney Morning Herald travel pages and is in the Oct/Nov 2015 issue of Great Walks magazine. 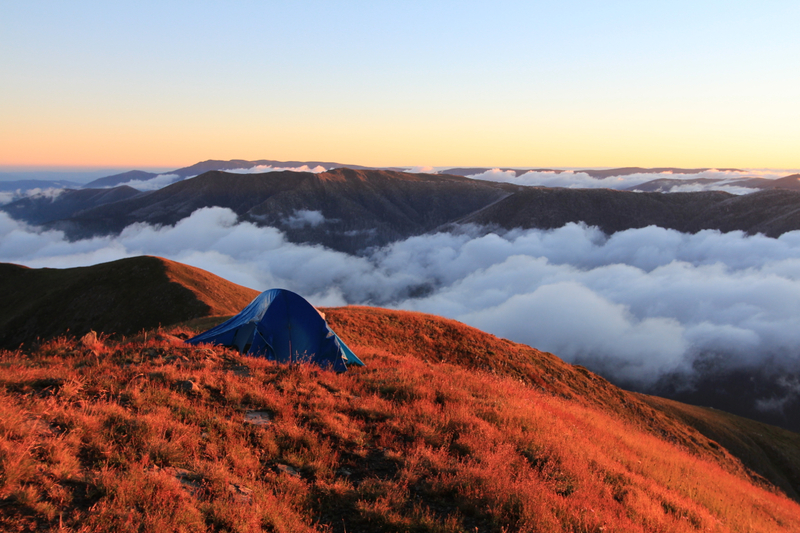 Our one night, camping on top of Mt Feathertop, matches all the hype, all the superlatives and a few more that I would like to throw in - dramatic, stunning, a night to fill the soul with wild wonder. Late sun drops below a dark blanket of cloud and the world above our high perch is suddenly burning with orange light. Caz is on the summit capturing some of his most beautiful photos ever. I am sheltering in our little blue tent making notes from the day when I hear voices. It is nearly 8pm but still light, a long summer day lingering beyond reason, as they do down south. I peer out of the tent and a woman calls out to Caz: "Please tell me you are standing on the top." 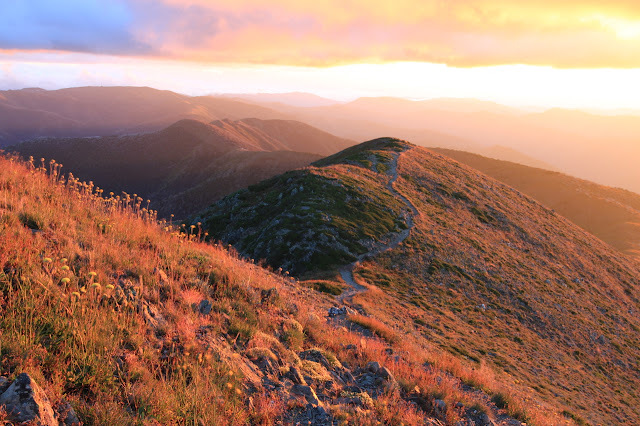 There are many approaches to Mt Feathertop, the most common being along Razorback Ridge from Mt Hotham ski resort or up Bungalow Spur from Harrietville. Another option is from the north, following the "true" Razorback Ridge from one end to the other. 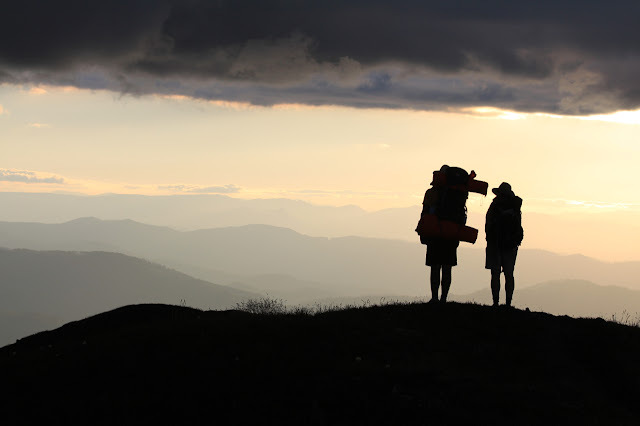 The couple we are about to meet have done just that - from Pyramid Hill through Dungey Gap and then onto the Stoney Top Track and onto Razoback. The 2km untracked section from the Hill to the Road took them four hours, ploughing through seven foot tall, post-fire regrowth that ripped two water bottles off their packs and left them tattered and scratched. They are buggered and thirsty but laughing. 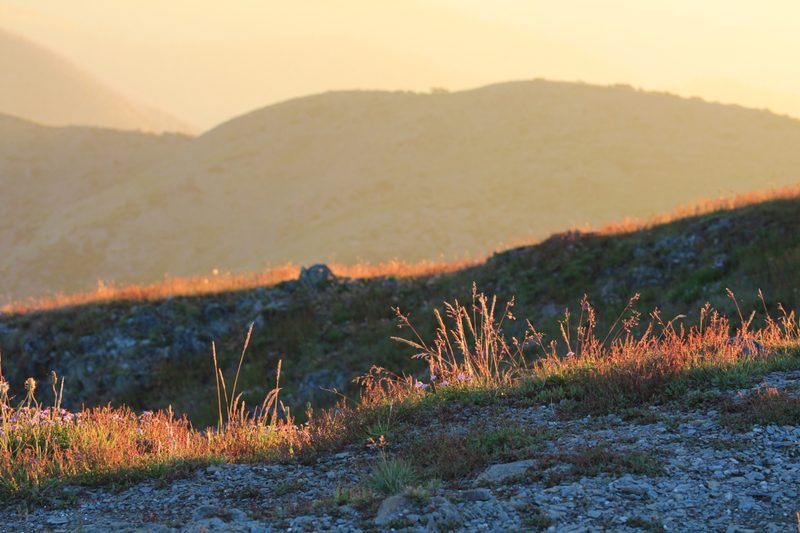 They walk on to Federation Hut in stunning sunset light. Tomorrow they will walk along Razorback Ridge jump on their mountain bikes, chained behind the hut, and fly along the winding road into Harrietville. Another way to tackle Mt Feathertop is to be young and crazy and take a couple of mates, push yourself on big days so you can get to the Harrietville Pub in time for some award-winning Chicken Parmigana. Earlier in the day, at Federation Hut, we met three young men, first year of uni, on a big adventure. They had walked from Mountain Creek, up the Staircase Track to Mt Bogong, then on to Cleve Cole Hut then across to Roper Hut then a 32km day to Blair Hut, running downhill when they could. Then up to Federation Hut and to Mt Feathertop for a quick summit bagging. 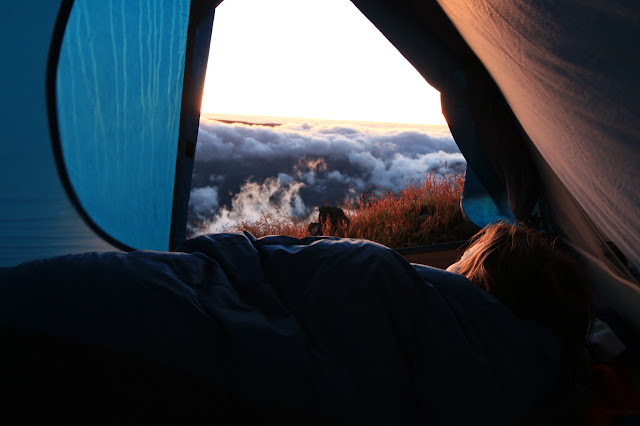 By the time we set up our tent they should be in Harrietville eating chicken parma. In contrast to all of our summer rambling, the history of people being drawn to Mt Feathertop in winter makes me think of people who have tasted an exotic food in wilder places then return home to try and repeat the experience with the ingredients they have at hand. It seems to have drawn in many old European skiers and mountaineers, or those locals with experience of high, sheer places of snow bound peaks and crazy ski runs. For an outstanding article on the history of the peak - and the people on it - see the AustralianMountains website where you can read more of this: "The first winter ascent [of Mt Feathertop] was made by members of the Bright Alpine Club in September 1889. They wore snow shoes, not crampons or skis. The first skiing on the Razorback was in 1900 when brothers Harry and Peter Petersen skied from their mine on Mt Tabletop to Harrietville via Bon Accord Spur. At the southern end of the Razorback, Peter triggered an avalanche when a cornice collapsed beneath him." For us, it is a stunning morning to wake on a feather top. An icy wind rises with the sun and hits the tent ropes and rolls itself into twists of air that shudder and whistle. The wind reminds me of a tour guide I once encountered - fluent in 12 languages and switching easily from one to the other. The wind speaks with high mountains, treetops and clouds, feathers and valleys. I am monolingual. The coils and knots of air are musical, but uninterpretable. I only speak my own breath, blowing it into my hands to warm them. The wind, meanwhile, coaxes clouds south through the valley below. Even the high Bogong plains are blanketed in cloud. The tent is dripping with dew and condensation. Sunrise itself lacks any spectacular colour but the effect of the clouds covering the world below us, drifting and moving like a waking beast, is dramatic and beautiful. Finally, it all rises up to meet us and we descend in the mist. The vast views are gone and we move quietly; muffled and hidden from where we stand in the world. But then a voice drifts in again. A solo walker is heading for the summit, muttering to himself and focussing on the hard, breath-baiting climb. He does not see us crouched in the stunted trees having morning tea. There have been other walkers throughout the past days - all making personal pilgrimages to this mountain of Australian mountains. Their stories reassure me of our human desire for drama - the way we seek out physical challenges and giddy heights in dramatic landscapes. 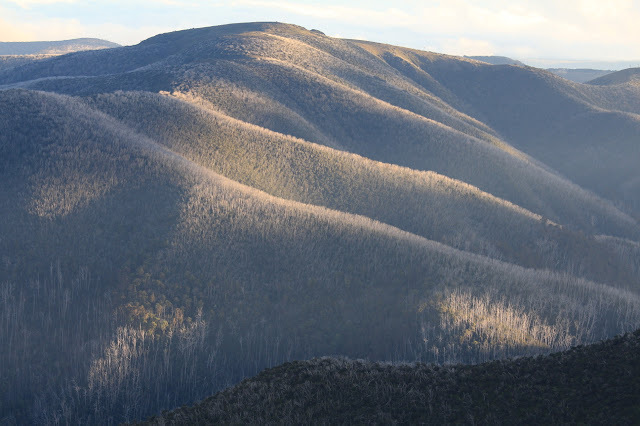 Below Mt Feathertop, the slopes are cut by Hellfire Gully and Avalanche Gully. These intimidating, dark places have claimed lives and standing on the summit ridge I certainly feel a distinct airiness to the altitude. Feathertop may not be Victoria's highest peak but it feels like a summit, with all the world below my feet. If I take a few too many steps in the wrong direction, I have only air to walk on.